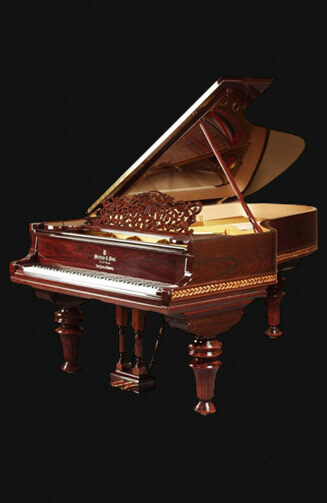 Restore your Steinway piano with K&W MEYER ! A brand new piano is a wonderful thing. But what about those pianos that have already had its best time long ago ? Don’t you wish them to be as beautiful as they once were when you see such pianos ? At K&W Meyer we are passionate about old pianos and the history behind them. This is why we have perfected the art of piano renovation. Because we strongly believe that a properly restored piano can be as good as a new one ! We specialize in Steinway renovations, but you can always find all kind of beautiful restored brand-mark pianos in our inventory. We restore Steinway pianos as well as Bösendorfer, Bechstein, Blüthner and many, many more. If you are looking for a restored, good as new, instrument – we sell Steinway pianos as well as other restored brand-mark grand and upright pianos. Another specialty of ours is taking pianos from the Golden Age and creating custom art-case pianos – pianos whose outer cases are designed to make an aesthetic statement (e.g., to complement a particular furniture style or era) or customized to match each owner’s specific taste or style. Each of our one-of-a-kind pianos is faithfully restored by our craftsmen drawing on centuries of woodworking techniques. In addition to creating a custom case, K&W Meyer of course refurbishes the piano itself, bringing it up to contemporary playing standards (quality that is completely comparable to a new piano). From start to finish, it takes three to four months to complete one piano renovation. The result is a family heirloom that will continue to increase in value, an exquisite musical masterpiece that evokes a sense of history and embodies the musical excellence of a brand new piano. Indeed, an art case piano from K&W Meyer encompasses the best of both worlds. Whether you are a concert pianist or a beginner, a serious collector or simply someone who appreciates the beauty of incredible craftsmanship, a musical masterpiece from K&W Meyer is the perfect piano for you. Take a moment to browse our collection and inventory (Now Available) and see what we can offer - then write us an e-mail or give us a call.